Another card to share with you today. I love these Fred B. Mullett stamps! 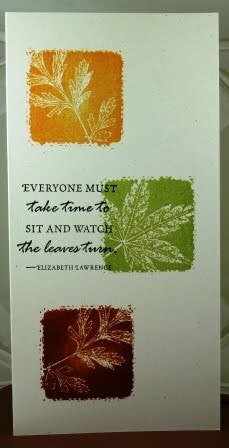 Simply stamped each of the leaves on Stampin’ Up! Ivory Naturals cardstock and added the Impression Obsession sentiment. It’s one of my favorites too! Ink colors from Stampin’ Up! are Peach Parfait, Pear Pizzazz and Cajun Craze. Take some time for yourself today…e-mail someone you haven’t in a while, read a book, or perhaps enjoy a walk. Be good to yourself!